Facing a strong challenge from Twin Falls, the Wood River High tennis team pulled together and played two days of outstanding tennis at the state-qualifying Great Basin Conference 4A meet Wednesday and Thursday in Twin Falls. Wood River, qualifying 12 of its 16 entrants for upcoming state competition, piled up 36 points in girls’ doubles and 32 in boys’ doubles while playing Twin Falls to a standstill in the singles events. And the Wolverines needed every point. Coach Carlos Meza’s Wolverines out-scored Twin Falls 120-107 for the Hailey school’s fourth consecutive Great Basin overall tennis championship and fifth in six years. Wood River won three of the five final matches on Thursday. In the girls’ team totals, Wood River won its sixth straight Great Basin title by a hefty 63-43 margin over Twin Falls. And Wood River pushed Twin Falls to the limit in the boys’ standings, although the Bruins won the team title 64-57. Basically, Wood River had a four-point advantage over Twin Falls based on Wednesday’s preliminary matches, and then extended the winning margin to 13 by the end of Thursday’s first-place and third-place matches to finalize state berths. Senior Lily Richards captured the rubber match in her season-long duel with Minico senior Eva Mollik by a 7-5, 6-3 margin in the girls’ singles championship. 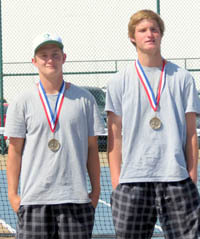 Having placed second in boys’ doubles last May, Wolverine No. 2-seeded seniors Cole Caminiti and Josh Morell earned first place honors Thursday with a hard-fought 3-6, 7-6 (5), 6-2 victory over No. 1-seeded Andy Carter and Cole Hunt of Twin Falls. The Twin Falls pair had beaten Caminiti-Morell in their only previous meeting during the season. The No. 1-seeded girls’ doubles pairing of senior Margaret Reutter and sophomore Haley Cutler provided the other gold medal for Wood River Thursday with a 6-1, 6-4 final match triumph over their teammates—unseeded junior Alex Taylor and her sister, freshman Samantha Taylor. Second place in boys’ singles belonged to No. 2-seeded Wood River junior Stephen Pfeiffer. Twin Falls’ top-seeded senior Dallas Hunt won his first Great Basin singles title 6-2, 6-0 over Pfeiffer in the finale. The other event champions Thursday came from host Twin Falls, in mixed doubles. Indeed the Bruins swept the top two spots in mixed doubles with winners Brad Pierce and Karin Olsen. They beat the runner-up team of Jacob Wickern-Jordyn Clark by scores of 6-3, 6-4. A productive finish of third place came from Wood River’s unseeded tandem of sophomore Erik Wilander and freshman Danny Graves in boys’ doubles. They combined for five match wins including the 6-3, 4-6, 6-3 third-place victory over seniors Andrew Wickern and Shane Tucker of Twin Falls. Placing fourth in mixed doubles for Wood River were No. 4-seeded sophomores Taylor Cooper and Tate Morell. In the final accounting, Wood River qualified 12 for state, Twin Falls 11, Burley 5 and Minico 4. The top four finishers in each event qualified to represent the conference at the State 4A tournament May 17-18 at Boise Racquet and Swim Club. The 4A State meet is a seeded tournament starting in 2013. Eight players or teams are seeded in each event at the 2013 State 4A tourney—the top four seeds this coming weekend at Boise being the district champs from Districts 1/2, District 3, District 4 and Districts 5/6. Great Basin champions: 2002—Century of Pocatello. 2003—Century. 2004—Jerome. 2005—Pocatello. 2006—Century. 2007—Century. 2008—Century boys, Wood River girls, Wood River overall. 2009—Century boys, Wood River girls, Century overall. 2010—Wood River boys, Wood River girls, Wood River overall. 2011—Wood River boys, Wood River girls, Wood River overall. 2012—Wood River boys, Wood River girls, Wood River overall. 2013—Twin Falls boys, Wood River girls, Wood River overall.